Fine Arts,Thiruvananthapuram and MFA from Faculty of Fine Arts, M. S. University, Baroda. 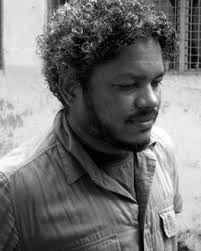 He has made a conscious decision to return to his native state of Kerala to further hone his painterly practice. He has participated in many group shows and art fairs in India and abroad. His major shows include Aicon Gallery, New York (2011), Saatchi Gallery, London (2010),‘The Silk Road’, New Chinese, Indian and Middle Eastern Art, from the Saatchi Gallery London, at Lille3000, France (2010), Bodhi Space, Mumbai (2008), OED Basement, Kochi (2008), Bodhi Art, New York (2007), Galerie Helene Lamarque, Paris (2007), Bodhi Art Singapore (2006), Bombay Art Gallery, Mumbai (2006) and Kashi Art Gallery, Kochi (2004). He has curated ‘Making Art – Let It Happen’ (2009) and ‘Earth’ (2010). His selected videos include Sermon (2012), The Teacher of Incongruous Lessons (2011), A Short Passage of Fire (2008). He passed away in 2016.